In many ways, associations have been innovated out of relevancy, or at least the relevancy they held prior to the digital revolution. Almost nothing can be found online more readily, for less money, than education and networking. Association members can now gain industry-specific knowledge from blogs and digital publications, rather than just the association’s trade journal. Association members can learn from colleagues from both within and outside of the industry using webinars and other virtual training opportunities. Even Massive Open Online Courses (MOOCs) represent a new source of competition for education historically provided by an association. Networking is also a core association offering—and again, something that can be found without paying association dues and flying across the country to attend a conference. Even as a one-time association professional, I was amazed at how many of my colleagues I met through LinkedIn, rather than at ASAE conferences. The blunt reality was that for me, LinkedIn was an infinitely more important and valuable networking tool than my trade association. Even advocacy has been disrupted by social media. It used to take millions of dollars and an entire industry to move the needle on public policy. Now a campaign supporting or opposing legislation using Twitter can be just as effective as a coordinated industry effort. Associations do other things besides education, networking, and advocacy, but to one degree or another those three offerings form the core of what most associations offer their members. However, associations can still provide valuable programs and services to members. One association I worked for created an in-house, for-profit insurance company offering errors and omissions insurance to members. Another association I consulted for became the source for data for an entire industry—so much so that the insight offered in the association’s annual industry outlook, available to members only, was the primary motivator for members to join the organization. Every association is different, and figuring out what your organization needs to do to remain relevant will depend on the needs of your industry. That said, every association needs to share one thing in common if it wants to continue to play a valued role in its industry. The common trait every association needs to share? And innovation starts at the top, with the Board of Directors. That’s a bit hard to imagine, given that the typical board meeting sounds like something straight out of the 19th century. First, there’s the arcane rules and language, all of which can make a board meeting sound like the Senate debating the Missouri Compromise, rather than a regional association of electricians deciding whether to hold its meeting at the Des Moines Holiday Inn or the Best Western of Greater Des Moines. Then you get to the reams and reams of paper. A board meeting is the last place in America where you’ll come across an inches-thick binder full of paper. This return to the 19th century that happens during most board meetings makes it more difficult to implement the culture of innovation your association needs. It’s a lot harder to talk about implementing the change your association needs to better serve members when your board of directors hasn’t used innovation to make its own work more efficient and effective. Fortunately, it’s easy to begin creating a culture of innovation within your board of directors. 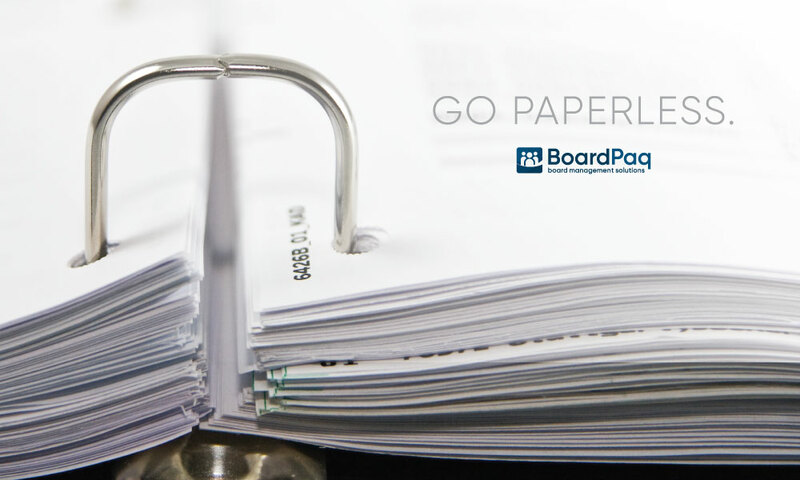 BoardPaq, the board of portal of choice for a growing number of associations, will allow your board of directors to do everything from conducting paperless meetings to engaging in collaborative strategic planning. The result will be a truly innovative board of directors. And ultimately, a more innovative association.